Toboggan run equipped with floodlights, leading from the top station to the base terminal of Hochgurglbahn mountain gondola. Effortless ascent from Pill with Hochgurglbahn gondola. Every Friday until 22.12., every Thursday from 28.12. Winter fun at its very finest! 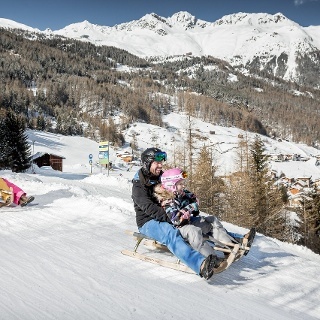 There is nothing more rewarding than a fun-packed toboggan adventure together with your family or friends, followed by a stopover at a picturesque mountain inn. This is an absolute must during your winter holiday in Obergurgl-Hochgurgl. 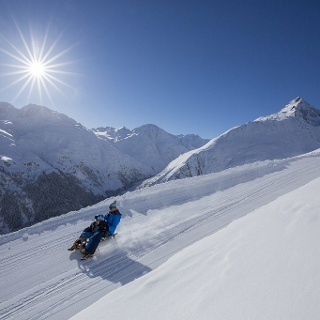 The unrivaled highlight can be found in Hochgurgl: a winding, three kilometer long natural toboggan run leads from the top station of Hochgurglbahn mountain gondola down to the valley. Enjoy an effortless ascent with the mountain gondola from the hamlet of Pill. 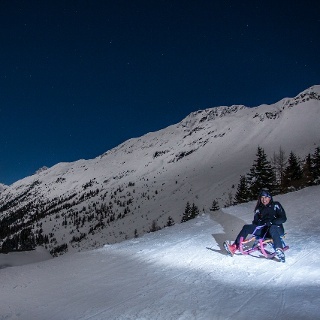 Romantic night sledding is scheduled once a week on the floodlit track, followed by a stopover at "Downhill Grill". Winter holidays with absolute snow guarantee for all kinds of sports.